Critical Reading and Writing in the Digital Age is a fully introductory, interactive textbook that explores the power relations at work in and behind the texts we encounter in our everyday lives. Using examples from numerous genres – such as fiction, poetry, advertisements and newspapers – this textbook examines the language choices a writer must make in structuring texts, representing the world and positioning the reader. Assuming no prior knowledge of linguistics, Critical Reading and Writing in the Digital Age offers guidance on how to read texts critically and how to develop effective writing skills. a brand new companion website at www.routledge.com/cw/goatly featuring projects, quizzes and activities for each chapter, a glossary and further reading. 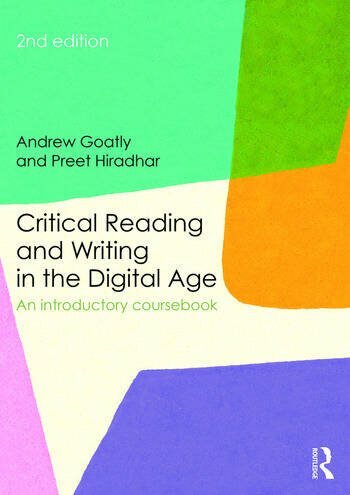 Written by two experienced teachers, Critical Reading and Writing in the Digital Age is an ideal coursebook for students of English language. Andrew Goatly has taught English Language and Linguistics in colleges and universities in the UK, Rwanda, Thailand, Singapore, and Hong Kong, and is currently an Honorary Professor at Lingnan University, Hong Kong. He is the author of The Language of Metaphors (Routledge 1997). Preet Hiradhar is Assistant Professor in the Department of English at Lingnan University, Hong Kong.